This 4-week healing plan will assist you in releasing and healing the emotions and beliefs that keep you stuck in unhealthy patterns of never losing weight, losing and gaining it back, or fearing you will gain more. It will also assist you in healing a negative body image and the pattern of body shaming. Until you heal your negative emotions and limiting beliefs (both known and unknown), you will have difficulty succeeding at healthy eating or fitness plans. By clearing old energy from your mental, emotional, and physical energy fields, you will be open and inspired to create eating and fitness plans that are perfect for you. At the end of this 4-week healing plan, you will have created a positive relationship with your body, and feel motivated to eat healthy and exercise. 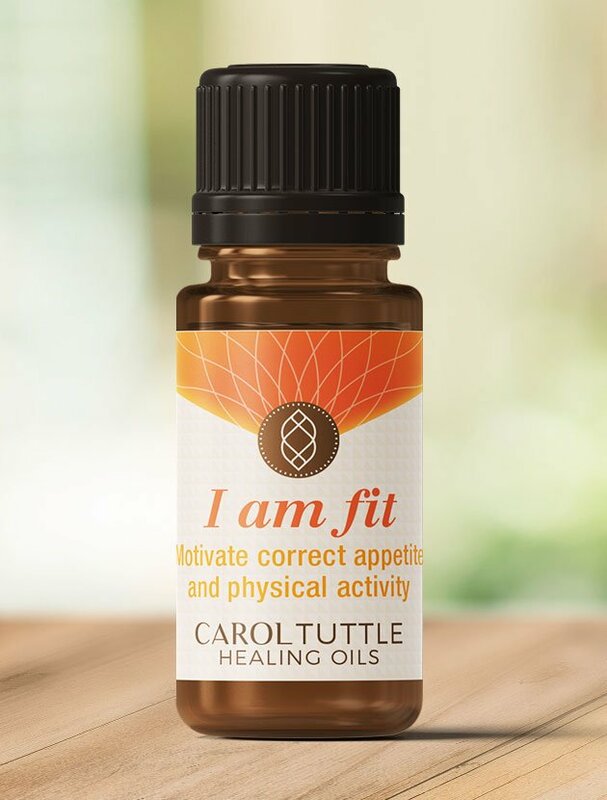 The oil customized to support you in this Healing Plan: I am fit. Do each of these short exercises every day of this 4-week healing plan. In other words, do these daily practices along with the healing sessions for Week 1. When you move on to Week 2, continue to do these practices daily. The list may look long, but the techniques are quick once you’re familiar with them. Each technique resets your experience with weight and food. Listen here or download and listen on the go. Listen to this every day or alternate it with the next audio track daily script. Choose one a day, using them both intermittently during your 4-week plan. Listen here or download and listen on the go. This audio session is highly supportive to listen to while exercising. Doing this energy healing technique when you first start your day helps you stay clear of taking on others’ energy. You need to stay grounded in your own energy in order to reach your healthy goals. You can use this technique as you feel it is supportive throughout the day. Doing a Clearing Walk for at least five minutes a day is ideal. If you are strapped for time, commit to doing it two times per week for at least 10 minutes. As you walk, repeat this affirmation: “I am fit and healthy.” As the instructions in this video outline, see what negative beliefs come up as you do the walk. Each day, choose one (or several) of the following sentences to finish. Write your answers in a journal or notebook. Write quickly. No overthinking. See what comes up. Keep this practice fresh by selecting a different sentence to finish each day. “Dear Body, Do you feel you are getting enough rest? Sound healing, using Tibetan healing bowls, helps you process, clear, and ground your energy. They activate your energy centers to help you express your true self with more ease. Listen to this track while you do your Spinal Flush & Zip Up, Figure 8’s, Clearing Walk, or as you journal. This general overweight clearing will support you in letting go of hidden emotions and beliefs that keep you stuck in carrying excess weight. Food cravings are strongly tied to emotions. For example, you may crave sweets because your life lacks the sweetness you desire. This session will help you let go of food cravings that are connected to your emotions. Taking on other people’s energy could be causing undue stress and anxiety that then provokes emotional eating cycles. Not taking on other people’s energy will reduce and eliminate emotional eating. Your unmet emotional needs from childhood can cause you to feel unloved and deprived. Healthy eating habits can feel like you are only depriving yourself more. Let’s heal your inner child so you are free to create the best for yourself—including a healthy and fit body. As the group moves together through Week 1 of the Healing Plan for Weight Loss, Carol supports you with answers and a guided Clearing Session for Self-Sabotage. All other healing sessions vary from week to week, but this one you will do for the entire 4 weeks. Watch it again. Go through the exercise. Let things go. You may have hidden beliefs that insist that you need extra weight, or that it is not safe to let it go. This technique will help you release those beliefs. During an important stage of your childhood, you needed to feel that it was safe and desirable to live true to your Energy Type. Clearing any resistance to being your true self will help you have increased motivation to create a healthy eating and exercise plan as a lifestyle. If you are carrying old “stuck” energy, letting go of excess weight will be more difficult. Let’s clear that energy away. Before you move on to this week’s new healing sessions, go through this exercise again. The repetition helps to ground the new, healthy patterns. Hidden emotions and beliefs may make exercise seem like a chore. This clearing will help free your body up so it desires movement and fitness. Carrying other people’s “energetic baggage” requires your body to have a larger size, so it has a place to store the energy. As you let go of other people’s energetic baggage, you don’t need to take up extra space. This Coaching Call is full of wisdom and encouragement specifically focused on Week 3 of the Healing Plan for Weight Loss. Carol also shares 22 of her favorite healthy lifestyle products (giveaway portion now closed). Watch each of the 5 healing sessions below at least one time this week. This is your final week of your healing plan. Stick with it! This is your fourth week of this clearing session. Notice how different things feel this time, compared to your first week. Your body is compromised if you have a negative and limiting image of it in your mind. This clearing session will assist you in letting go of negative perceptions. Seeing your body fit and healthy will free your body up to manifest that for you. Your body cannot change and become fit and healthy if you are constantly projecting this negative energy on it. This clearing session will assist you in releasing shameful feelings and thoughts you project onto your body on a regular basis. Which destructive or dysfunctional patterns do you want to be free of when it comes to food and exercise? Think of specific things you do daily or weekly that you want to let go. This clearing session will assist you. Here at the end of your healing plan, you will set yourself up for success by putting your attention on what you want, rather than what you are worried about or what you want to avoid. Listen to this audio track this week and in the future, as you feel it is supportive to you. If an eating disorder is a part of your experience, this session will help you. Suppress appetite and reduce cravings, inspire healthy food choices. Prevent repeating patterns from occurring. The following gemstones can help relieve cravings, stimulate metabolism, and increase energy. Clear Topaz: Improves sluggish metabolism to burn calories more efficiently; also helps your body detoxify and manifest your ideal weight. Onyx: Helps you become more grounded and productive in the physical world. Onyx can help you break undesirable patterns or habits.